The man President Barack Obama wants as his defence secretary has suffered a torrid time at the hands of his former colleagues. You would never guess that Chuck Hagel had been a Republican senator for 12 years. The men he once sat next to treated him as an ideological enemy with views that are repugnant. Some were also trying to settle personal scores with a man they regard as a turncoat. In attacking him, they are also seeking to define Mr Obama - portraying his policies as defeatist and disloyal. Mr Hagel had been under attack for claiming "the Jewish lobby" had too much influence on America's politicians. So he went out of his way to stress that he had always been a "strong friend" of Israel - underscoring the fact for some Republicans, any criticism of Israel's government is unacceptable. A fellow Vietnam veteran, Senator John McCain, said he had fundamental questions about his one-time friend, who broke ranks with his party over Iraq. He said he questioned Mr Hagel's judgment and his world view. He tore into the nominee for suggesting, at the time, that the Iraq surge was a potentially disastrous policy. Sen McCain wanted only "yes" or "no" answers, not explanations. It is interesting that both men assumed the surge was beyond criticism. While it is unarguable that it was a military success, it is at least possible to contend it has had little long-term impact. Repeatedly the senators insisted he gave a simple "yes" or "no" to complex questions. These are old men who hold themselves in high regard, but seem to see serious examination of difficult problems as a personal affront. They desperately want to play "gotcha", but haven't the self-restraint to design effective questions. They love the sound of their own voices too much to trap their opponent. 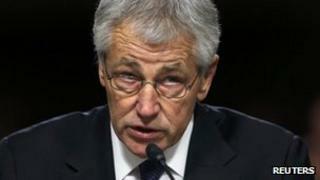 Mr Hagel was equally unimpressive, almost unprepared, for a level of hostility that had been signalled long in advance. Neither smart, nor humble, his tactic seemed to be a kind of bumbling blandness. The exception, in style if not ideology, was Ted Cruz, a new senator from Texas. Razor sharp, he ripped into the nominee with all the skill honed as a Texas solicitor general, playing sequences from al-Jazeera where Mr Hagel appeared to agree America behaved like a bully in the world and that Israel was guilty of war crimes. Rather than defend the views he expressed, the former senator suggested he hadn't understood the questions on the TV show. "Highly troubling," was Sen Cruz's verdict. That could be a verdict on the whole process, which has been used not to examine a candidate's fitness for high office, but to underline the rather obvious fact that the Obama administration does not share the world view of Republican senators, and they don't like their former colleague joining it.